It's very important to remember that the order you place your cards within your decks is just as important as the skill it self! Through trial and error, I've discovered this is extremely important if you want to win and win often. First off make sure you start a deck from scratch if this is first time. So remove any pre-existing decks you may have. This is how your deck will look once it's arranges. Slot 1 represents the first card you pick to go in your deck. In each deck that you create, you have to be conscious of card placement. Up to 3 skills can activate in a battle. Although activation is random, the order in which the skills activate is always the ascending order of when you placed the cards in your custom decks. 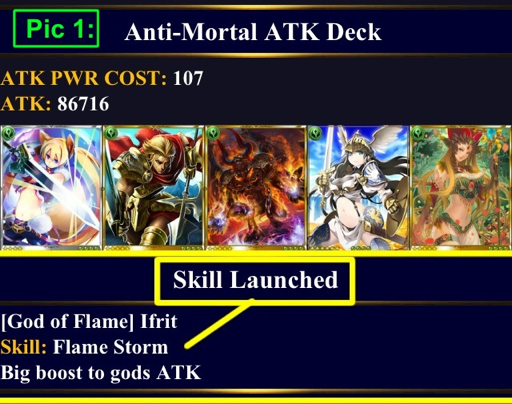 First off, the skill has be one that actually can activate in your regular attack deck for those of you editing this one. For example, HW skills (big boost to wall damage) and Def skills (big hit to attack all or medium boost to def) will not work in your regular attack deck. So if you insist on using Principality or Wraith in your attack deck you have to place them in the last slot. Reason being, whichever card you place in Slot 1 has a 100% chance of activating if the conditions I just spoke of are met. So Slot 1 skill no matter what, will always activate for you. [Pic 1, 2 & 3] Notice whether its one, two or three skills that activate, whichever is slot 1, will always activate first. The pics above and below in this deck has ifrit in slot one. 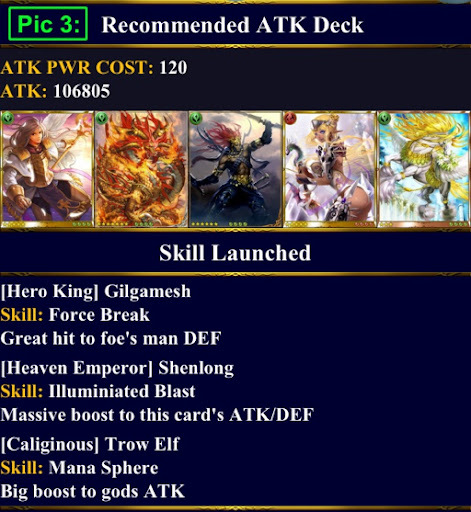 [Pic 3:] Even when using the recommended attack deck, the skills will go off in the ascending order they were placed in your deck. The probability of skill activation is determined mainly by slot placement. Over the past couple weeks, I used the attack deck shown in Pic 4 to attack my high ranking god opponent's decks. I switched around the slot placement for each of the 5 cards. The following stats are based on a complete analysis of 125 attacks total. Rather than pursue a foolhardy attempt to attack with every possible combination of the 5 cards, I tried a simplified rotation approach. By cycling the cards through each of the 5 slots (25x) to gain a better understand when and what frequency are skills triggered? 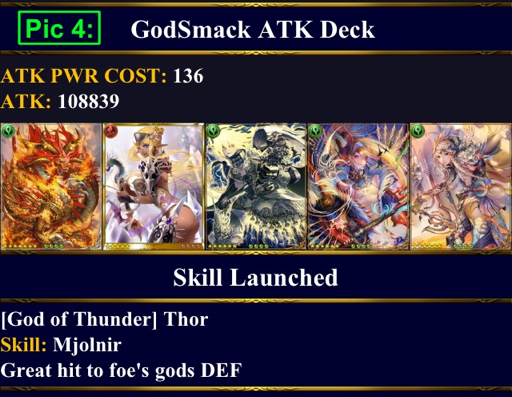 Side Note: In the decks featured in Pics 1 & 2, there's a skill that decreases a specific type of foe stats in slot 1 (Thor- Great hit to gods & Gilgamesh- Great hit to man). That skill will have the same activation probability as any other. For example, Thor in slot one will still trigger even if the opposition doesn't have a God in their deck. After performing an additional 100 attacks on my feeder account (using either less than 5 cards or cards without a useable attack skill), I pretty amazed by how much thought is put in to battling. I found that the probability of skill activation decreases around 5% in probability for each slot 2 and higher listed above. Again, these were based solely on my findings. So how do you know which skills to prioritize? Happy to help & sorry for the late reply. You ask a great question. However, there is no sure fire answer to this rule bc both can be equally important from an opinion stand point. However, the math doesn't lie. 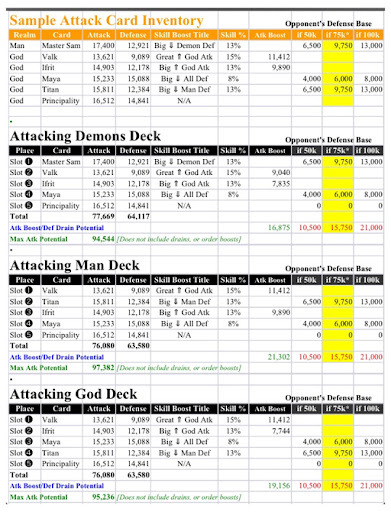 Select the menu option in this blog titled: [Skill Boosting], there's a full chart there that explains every type of cards possible skill combo and what percent the boost output will be for those cards. Skill level is another important component when deciding upon what cards to use in your deck. 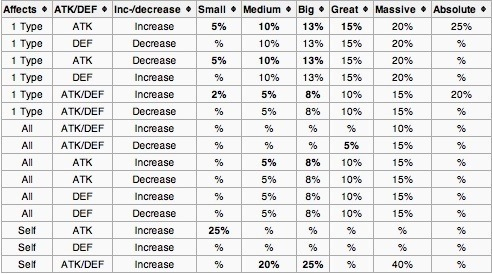 For each level (over level 1) up you increase, the card's boost percentage increases by 1%. Another contributing factor cygames has led us to believe (in their FAQ section within the game) is the higher the skill level, the higher the potential of skill activation. Lastly, I'm sure every ragetrades subscriber knows that where you place your card within your deck is also equally important. ★ Let's say worse comes to worse and only one attack skill goes off, which would always be your [slot 1] card. There isn't a one size fits all for battle decks! They give you up to 5 for a reason. Use this to your advantage. Try and play the odds by going not only on how high you can attack, but also how much you can drain from your opponent before their def boosting skills take effect! In which case, any boost they will receive will be based off their lowered base defense. if using mobile, tilt to landscape view. Hope this update helps! Be sure to check out the Skill Boosting Section to gain a better understanding of how skills are calculated and how the boosts work. 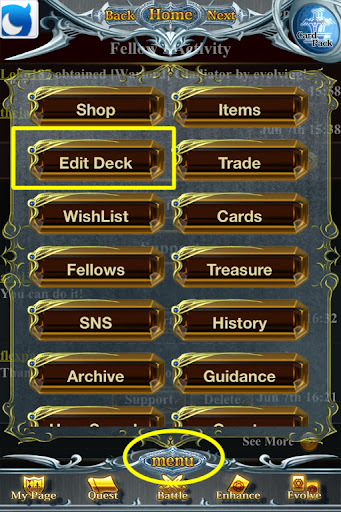 Be sure to place your customized deck at a higher priority than your "recommended" defense deck. Otherwise, the deck will always prioritize by highest base def amount instead of skill. It is now my understanding that you can calculate the total weight of a current battle in order of the appearance of buffs or debuffs in the battle animation. Starting with order and realm alignments, then going back and forth with the opponent. So if you have two boosters such as ifrit and Valkyrie. Which ever one shows up first is calculated off the base attack. Then as long as your opponent didn't set off an attack drainer, the following boost is calculated from the previous boost total. This can be a double edged sword Bc you might want to place your skills towards the end so they effect all of your cards, problem is they don't trigger at the same frequency as cards set to go off earlier. drain fires before before their boost, they're boost will be calculated based off that reduced base, rather than their original number. Make sure you do the math on your cards (include the skill level in math • 1% more than the chart graph shows above). Also many people underestimate the power of a (realm or non realm) specific def drainer. When a def drainer skill (Gilgamesh(15%), Thor(15%), Sanada Yukimara(15%), Date Matsume(20%), Sephirot(15%), Ark Dragon(13%), triggers before an opponent's def booster, the percentage is taken from the actual base. Therefore, any boost they get on their def is given to the reduced value. Thanks so much for the clarification about the percentages for slots 2-5. I've always thought that 2 & 3 were the same and that 4 & 5 as well. One thing I've heard before and from my experience "seems" to be true: When attacking a stronger deck you get more skills to go off then when attacking weaker decks. Maybe its just a myth, but it does seem that when I attack decks weaker than mine I usually only get my 1st skill to activate. Sometimes I get a second skill. When attacking stronger decks it seems that I usually get two skills and often 3 skills getting activated. Anybody ever notice this? Or is it truly random? 1) How do you put together a decent defense deck seeing as you don't know who realm wise will attack you? I assume there's no way to set up realm specific def decks. 2) Could you run through a step by step calculation that would illustrate the turn by turn sequence and the way boosts are calculated (off of base, stacked etc.) 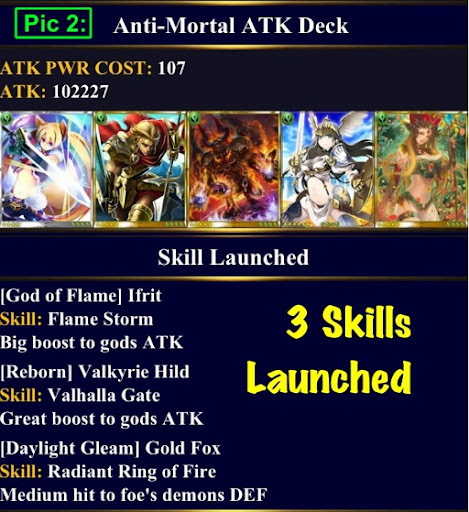 For example, could you run it for two players both in the God realm, both in an order, having the following decks atk: reshef, alluring angel, agni, kratos, gold fox; def: rhea, vayu, rhea, Rhea, lampetia assuming the first three cards listed for eacj all activate, their skill levels are 1, and they are all 6/10 max final forms? Thank you so much in advance. I really appreciate it. You've provided some interesting information here, and I appreciate you sharing your work and research with other gamers. However, I do believe you are mistaken on one point. Based on our order's testing, we've found that the animations really have nothing to do with the way in which boosts and hits are calculated. We've found the pre-battle boosts such such as attack leader, realm match and order boosts are first applied. This creates the base ATK and DEF totals for the battle. The skills of the cards that are activated in the battle are resolved against THOSE totals and seem to do so concurrently, thus there is no actual stacking of buffs or debuffs. We could be wrong, but we've gone over this in many different scenarios. Your thoughts? It doesn't matter in which order a drain or a buff is executed. I will explain why, but it basically comes down to basic math. You surely remember the order in which you calculate different arithmetic expressions. Like 5+5*5 equates to 30 instead of 50 because you muliply before you add. But since this (draining and debuffin) is both about division/multiplication it doesn't matter in which order you calculate it. I have a 25% buffer. Foe has a 20% debuffer. 125 K *0.8 = 100K. Foe has a 20 K debuffer. 100 K * 0.8 = 80 K.
80K * 1.25 = 100 K.
Your conclusion is inaccurate. Zuk's theory seems sound. In each example you have the same equation what Zuk had said is that there is a difference between their buffer activating on their base def and their buffer affecting their now already debuffed defence. You provided what would happen if you already hit them while they were debuffed. What Zuk is trying to say is that when you affect a person's defense while you are attacking them it is more effective than when you are increasing your att. I've just realized that you, incom, is just the type of person that doesn't research nonetheless read because your comment on skill boosting is completly irrelevant as well. When you told Zuk'z that her math is usually offf and that there was obviously a problem with her ifrit giving a total of 34% att boosting power.. She specifically said that her ifrit gains 34% because of it's boost and all the other boosts such as order boost, att leader boost, realm allignment boost etc... Therefore her Ifrit WOULD have a 34% boost. Your comment about getting hired to do her mathematical endevours goes completly out the window once you realize YOU'RE the one missing stuff not anyone else LOL! sorry! ^ where it says is towards the beginning of that rant it is supposed to be are. as in "you are an ignorant person"
Oo this is a good spot for info, I've visited often when I first started out (thanks!) so I'm surprised you don't know the way attack / defense is calculated. 1. Add 1 point to your total att/def for every card in your deck. That's your exact total and exactly how it works. There'll be a bit of rounding of course as we don't have fractions in the game. Try it out on your own deck when you attack someone. Eg. You have a deck of 5 4-6 Claymaids. For ease of calculation they are all skill 8 (which is 20% boost to man). You are also man realm and an attack leader, and the order has built all buildings. Step 1. 5 cards in deck so 87105+5 = 87110. Step 3. Realm boost 5% and assuming 3 Claymaids go off that's another 20% + 20% + 20% for a total of 65%. So 96038.78 * 1.65 giving you the final attack total of 158464. If the defender had a 20% debuff then the total would have ended up being 5% + 20% + 20% + 20% - 20%, 45%. So 96038.78 * 1.45 = 139256. Just do the exact same calculation for the defender. Why exactly do they have pre designated defense decks labelled "anti-mortal," "anti-divine," and "anti-demonic" if the decks do not activate according to the opposing player's realm? What is the point if the deck that has highest priority will always activate? Card 1 procs 100% of the time and after that it's a little different. The chance for a second card to proc is 50%, starting with the 2nd card of the deck. If it does not fire, the 3rd card has a 50% chance and etc. Thus, the chance of your top card firing alone is only 6.25% if you have 5 cards with skills in your deck. If a 2nd skill does fire, then the same process is used to determine whether a 3rd proc will fire but the percentage drops to 25%. So if the top 2 skills fire, the 3rd card will have a 25% chance to proc and if it fails it's off to the 4th card at 25%, etc. I am interested to know how def point reduction works in battle (for example in a holy war where leader leaders are usually attacked multiple times in succession). And will lower cost decks automatically enable as points reduce if they are higher priority than the recommended deck?